Microsoft word is a word processing computer package/software or a graphical writing program which is developed by Microsoft Inc.
Abbreviated as MS-Word and usually referred to "Word" this computer program is mainly use for document preparation. 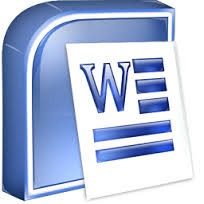 In other words, the purpose of Word is to enable it's users to type and save documents. MS word is referred to as a graphic word processing program because it is a WYSIWYG (What You See Is What You Get) program. Unlike text editor program, MS word users are not required to have a programming knowledge before they can use it. This means that it's users can change the visual style of writing - like bolding of text, changing the font style and size - with just a click of some buttons. The format at which microsoft word documents are saved is ".DOCX", this means that any document which it's file name extension is .docx is prepared using the microsoft word program.